Hiring an interior designer may feel like a dream fit only for the wealthy. The road to finding the right designer can be as arduous as the whole process is expensive, and then there’s the problem of finding the time. But what if you could have your design dreams realized by hiring a decorator remotely? That’s the idea behind sites like Havenly.com: an online interior design service that matches you up with a designer who will decorate and shop a room for a flat fee of $185. Take a style quiz. Create a free online style profile so the site can match you with the right interior designer for your style needs. Give a few more details. Schedule a call with your designer (or fill out a longer design brief), then pay $185 for your room design. Provide feedback. After five business days, you will be provided with two concept boards from your designer. Provide feedback, and get two more rounds of revisions to your board if needed. Design. 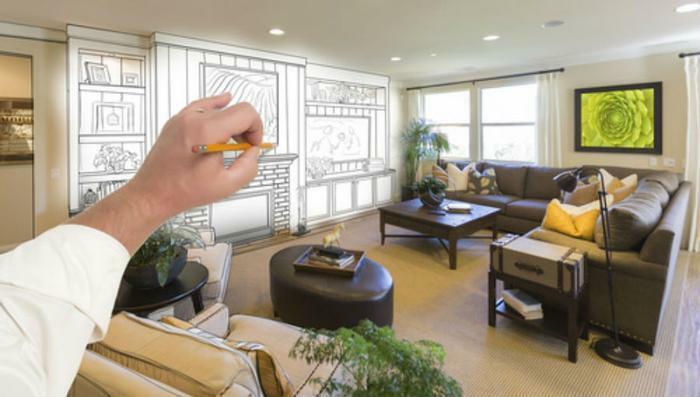 After about a week, you’ll be provided with a finalized 3D design of your space. Shop. Havenly will pull everything you need to execute your design via a check out card. Buy what you like and access it over time if needed. With DIY design being so accessible, it’s easy to see why many people might dismiss interior design services. Create a vision board on Pinterest, for example, and one may feel like they’ve got their design goals mapped out and ready to execute. By comparison, the interior design process seems unnecessary, slow, and expensive. But sites like Havenly may pull a new group of people into the world of interior design. Leura Fine, longtime interior designer and founder of Laurel & Wolf, realizes that the landscape has been changing. “Everything around interior design was moving into the future, except for design services,” Fine said. Her desire to connect clients and designers through a digital platform led to the creation of online interior design website Laurel & Wolf. As with any other service moving into the digital age, hiring an online interior designer has its drawbacks. According to Laurel & Wolf client Arielle Pardes, one of the biggest drawbacks of working with a digital designer was not being able to predict how things would look in her space. “Just like online shopping for clothes, sometimes an item arrives and it just looks…wrong,” said Pardes. In the end, however, Pardes was happy with the result. Can you create a reclaimed wood accent wall in under an hour?